WASHINGTON, March 4, 2019 /PRNewswire/ -- At the 15th Annual Conference of the US Human Proteome Organization (www.ushupo.org), Bruker announces further progress in high-sensitivity, high-throughput plasma-proteomics using the timsTOF Pro mass spectrometer connected to an Evosep One low-flow chromatography system. Bruker also highlights advances in PEAKS, Protein Metrics, and MaxQuant 4D proteomics software supporting routine acquisition and information extraction using large-scale accurate collision cross section (CCS) values. Dr. Roman Fischer, Nuffield Department of Medicine, Project Leader - Discovery Proteomics, at Oxford University, Oxford, UK, said: "The 4D feature matching capability enabled by TIMS, boosts the number of quantified plasma proteins in a single 11.5 min LC-MS/MS run with low sample amounts injected. Collectively, there were 772 plasma proteins quantified with 100ng injected using these short gradients, where 66% of the identifications correspond to only 10% of the protein mass of plasma. This demonstrates that the method can achieve sufficient depth to discover biomarkers on low abundance proteins. Achieving this depth on the timsTOF Pro offers completely new possibilities to analyze large sample cohorts of hundreds to thousands of samples for biomarker discovery in blood plasma." Dr. Gary Kruppa, Vice President Proteomics at Bruker Daltonics, commented: "A common practice to achieve greater proteomic depth is sample pre-fractionation. However, this results in long measurement times, which is often compensated by multiplexing and chemical labeling. Although isobaric labeling methods seem attractive in principle, they suffer from ratio distortion that can skew or compromise quantification of low-abundance proteins between samples. A label-free quantitation approach combining short LC gradients with high selectivity of 4D matching is available only on the timsTOF Pro, and provides a compelling alternative that can be applied to thousands of samples in high-throughput proteomics." Key new software developments shown at US HUPO 2019 include the release of PEAKS On-line for the timsTOF Pro, a server software that is parallelized with the ability to run on clusters or multi-CPU machines. In combination with the new denoising algorithm in timsTOF Pro acquisition software, which reduces the data file size by a factor 5x to 10x without any noticeable loss of information, the scalable performance of PEAKS Online facilitates state-of-the-art high-throughput proteomics experiments. Protein Metrics Inc (PMI) also added peptide CCS support to their Byonic database search algorithm, which is well accepted by pharmaceutical and biopharma scientists for HCP and other biologics characterization and discovery workflows. Dr. Eric Carlson, President and CEO of Protein Metrics Inc., stated: "We are thrilled to include the analysis of timsTOF Pro and PASEF data in our software for our customers. For applications such as disulfide bond analysis, glycoanalysis, and host cell proteins, the ability to include ion mobility and CCS data as the 4th dimension of separation, will provide even deeper insights into protein samples to drive drug discovery and development." Please join Bruker's proteomics team today, March 4th, at 12:35 - 1:20 pm in the Regency Room for the Bruker Lunch Seminar at US HUPO with the keynote talk: "Unlocking the Power of the Fourth Dimension: MaxQuant for TimsTOF Pro", by Dr. Juergen Cox, Research Group Leader at Max Planck Institute of Biochemistry, Martinsried, Germany. The proprietary timsTOF Pro system uses PASEF, enabled by Trapped Ion Mobility Spectrometry (TIMS), to provide industry-leading data acquisition speed for shotgun proteomics. 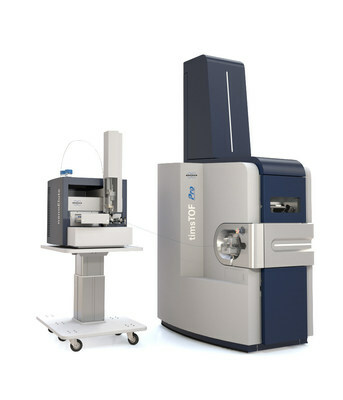 The unique dual TIMS geometry of the timsTOF Pro, combined with the time focusing of the ion packets in the TIMS device, means that the speed advantage provided by PASEF comes along with simultaneous improvements in sensitivity and quantitation. All of these gains in speed, sensitivity and quantitation maintain the advantages of Bruker's high-performance QTOF mass spectrometers, including high mass resolution (resolving power of 50,000 FWHM even at highest acquisition rates) in MS and MS/MS mode, ppm accurate mass, and high isotopic fidelity (True Isotopic Pattern, or TIPTM). The robust timsTOF Pro with PASEF gives scientists the tools to dig deeper into the complex cellular machinery with the potential to discover low-level, biologically significant peptides or proteins, or validate them in translational proteomics research. Bruker is enabling scientists to make breakthrough discoveries and develop new applications that improve the quality of human life. Bruker's high-performance scientific instruments and high-value analytical and diagnostic solutions enable scientists to explore life and materials at molecular, cellular and microscopic levels. In close cooperation with our customers, Bruker is enabling innovation, improved productivity and customer success in life science molecular research, in applied and pharma applications, in microscopy and nanoanalysis, and in industrial applications, as well as in cell biology, preclinical imaging, clinical phenomics and proteomics research and clinical microbiology. For more information: www.bruker.com.